Johnson, R.I. 1998. 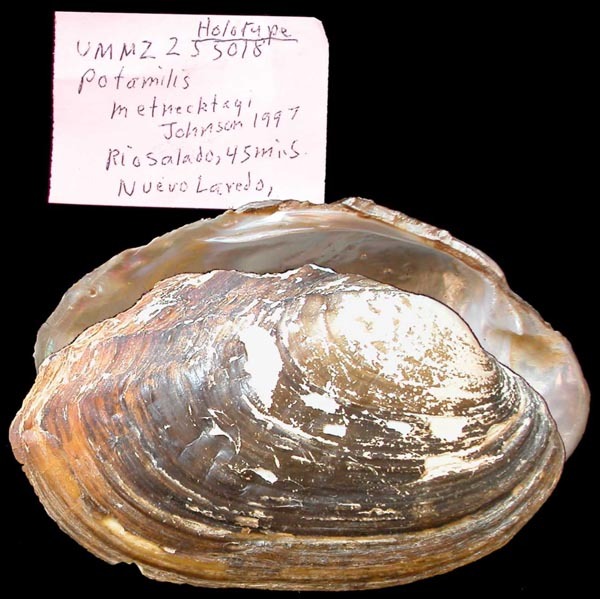 A new mussel, Potamilus metnecktayi (Bivalvia: Unionidae) from the Rio Grande system, Mexico and Texas with notes on Mexican Disconaias. Occasional Papers on Mollusks 5(76): 427-455. Actinonaias walkeri Baker, 1922. — R.I. Johnson (1998: 438). Cyrtonaias tampicoensis (Lea, 1838). — R.I. Johnson (1998: 448). Disconaias disca (Lea, 1838). — R.I. Johnson (1998: 434). Lampsilis explicata (Morelet, 1849). — R.I. Johnson (1998: 438). Potamilus metnecktayi new species. — R.I. Johnson (1998: 429). Potamilus purpurata (Lamarck, 1819). — R.I. Johnson (1998: 431).